I got some mail late this week. WOO HOO! Not my model stuff, but I did get word that the fabric was holding up the order and it would be on it's way soon. I finished Romy's Austrian Spot Sampler. YAY! 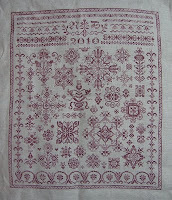 It's stitched 1x2 on 45 ct white Florence, using a limited edition thread from HDF, called Double Dusty Rose. Unfortunately, it's from the old dye line, the closest colour to it now is a little more purplish. Thankfully, I've still got 2 1/2 spools of it. :D I'm very happy with how it turned out! Excuse the wrinkles, I haven't ironed it yet. :) This piece stitched up surprisingly quickly - I was able to do a couple motifs a day on my lunch at work, and finished the rest at home over the past week or so. I'm now dragging Sampler Cove's Enya back and forth to work with me, it's coming along rather quickly as well - over 1/4 done already. Of course I forgot it in my locker at work, so I'll have to take pics another day. And after a very long and tiring day at work, I'm gonna go shower and stitch!! Your Austrian sampler looks wonderful, but i know i have already told you that! Double dusty rose sounds very much like something i would have loved... what is the colour that is closest to it now? i went to do some of my Dido yesterday after seeing amanda's finished Enya , but dido has wandered....... hope she is just hiding temporarily! I'm happy to send you a spool of the Double Dusty Rose, but be warned, it's six strand! To give you an idea of how old it is, it's on the snap spool! Oops, meant to add that the closest match to the Double Dusty Rose is the lightest two Ultra Maroons!